Age 14? / 1983? 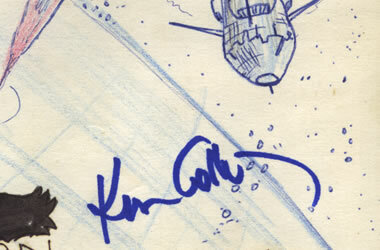 The planet Hoth, as autographed by Kenneth (Admiral Piett) Colley! Up until a few years ago in Ireland we had a pretty regular staging of the INVASION events, featuring the costumed Emerald Garrison—and!—actors and crew from the Star Wars movies themselves. 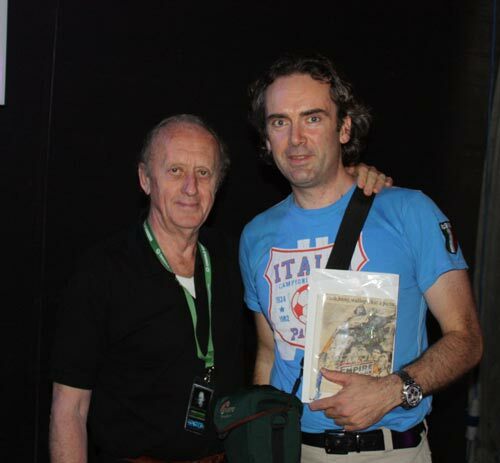 Kenneth Colley (Admiral Piett) and Me at the INVASION convention in Cork a few years ago! It was nice to meet Ken. I’d brought along both of my Star Wars movie adaptations to the event in the hopes of getting them signed by Ken, Jeremy Bulloch (Boba Fett) and Billy Dee Williams (Lando Calrissian). I was successful on all counts. You can be sure that I was keeping a tight grip on my once-off, unique comics. 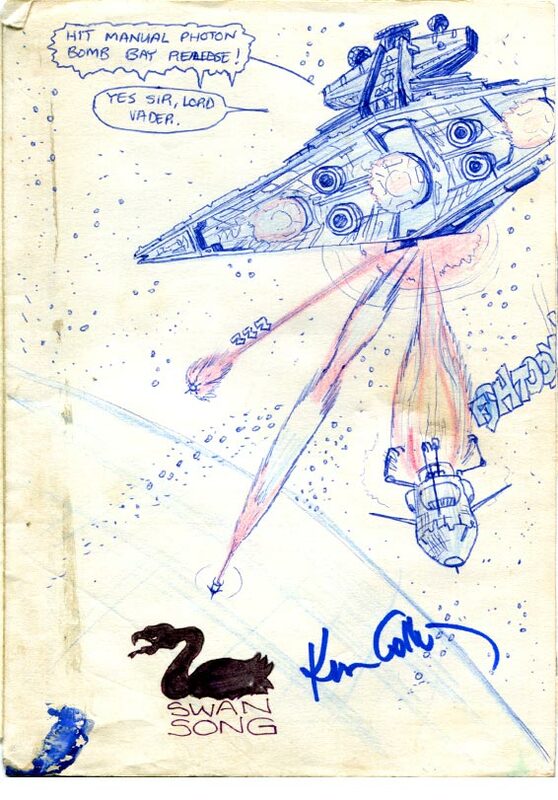 At previous Invasion shows, I’d had my ‘Star Wars’ adaptation autographed by the late Kenny Baker (Artoo), Garrick Hagon (Biggs), Paul Blake (Greedo) and Steve Sansweet (former president of fan relations at Lucasfilm). Ken was very nice and when I showed him my Empire comic, he gasped and exclaimed, “This is amazing. It must have taken you ages!” The incomplete book took a lot of work, but not as much work or time as the ‘Star Wars’ one. I veered away from chat about Star Wars and even his role as Piett in Empire, as I usually do when I briefly meet Star Wars peeps. Instead I mentioned his role as the Tramp in Dennis Potter’s old groundbreaking TV series The Singing Detective. “Gosh, I would have thought you’d have been too young to see that!” I replied that I didn’t see until a few years later, even though, at the time, I’d heard the other primary school kids pruriently talking about its fairly risqué content in the school yard. That was why it was on at about 10 or 11 o’clock at night! I think he was pleased that I’d appreciated his other work. Ken was very pleasant and I felt unrushed. He didn’t have a minder with him as Billy Dee did. I seem to have been getting pretty good at the ol’ drawing on this page—and indeed this whole adaptation. I was in no doubt whatsoever about what I wanted to work at when I grew up! I can’t tell you whether this was done before or after I saw Al Williams’ Marvel adaptation—which I have to say: blew me away, when my sister brought me home the first issue from her shopping trip to Dublin city. I suppose it sounds kind of spacey. That’s blue poster paint in the bottom left, just like on the front cover, and the ‘Swan Song’ logo was supposed to signify my youthful publishing company! I must say, I quite like the combo of blue biro and colouring pencils here. I’d love to read you comments below. Have you met Ken, or any of the cast from The Empire Strikes Back? Tell us all about it. Officer: "Yes sir, Lord Vader." Great first page, John. Your skills had developed incredibly since the start of the first comic. Not only is the artwork fantastic, but it’s quite different from the way the scene was depicted in the film. I wonder whether you were influenced by the Marvel adaptation, or whether this was your own take on the film’s events. Thanks Darren, thanks for dropping by. I’m not sure about influences. I must check the various official versions and find out!